There is no single method that is a ‘quick fix’ to manage Phragmites. A multi-method approach is critical for success and long-term results. All management strategies should be used as part of an integrated management approach combining several of the techniques described below. Check out our list of management guidelines for more information. Cutting Phragmites below the waterline effectively drowns the plant by cutting off its oxygen supply. This method is being successfully used at two very different scales: using large specialized machinery; and by manually using hand tools. Large specialized machines have been developed or adapted to cut vegetation under water. Phrag managers who have funding to purchase or rent this equipment may find it particularly useful in cutting shorelines or very wet areas that are otherwise difficult to reach. The Invasive Phragmites Control Centre has two amphibious Truxor machines which have been in near-constant use since they arrived in Ontario. This organization is led by Phrag expert Dr. Janice Gilbert. In Ontario, cutting under water is one of few options for managing Phragmites on shorelines due to a ban on over-water herbicide application. Read more on our blog post about this machine’s arrival in fall 2017. Hand-held tools like brush cutters can also effectively cut Phragmites below the waterline. For small areas or where funding is limited, this approach can be used by crews of staff or volunteers. The Ontario Phragmites Working Group and its partners recommend the use of a raspberry cane cutting tool. Read their advice for using this approach here (page 3). Using hand tools to cut Phragmites under water. Photo: IPCC. For this method to be effective, the Phrag stalk must be cut far enough beneath the surface so that new shoots sent up by the plant after cutting do not reach the surface. Dr. Brian Sorrell presented on this “snorkelling” phenomenon in a webinar – view it here. We are still learning about this approach, but believe that cutting 6 or more inches below the surface should be sufficient. Are you using this approach? Do you know more about it? Please let us know! In many cases, herbicide is the most effective method of non-native Phragmites management when it is used as part of a comprehensive integrated management approach. For more information on herbicide application see: A guide to the control and management of invasive Phragmites by the Michigan Department of Natural Resources. For a quick reference guide to appropriate herbicide mixing rates, see the handy Phragmites Treatment Herbicide Quick Guide. Regulations on the application of herbicides and required permits vary depending on location. Check with local authorities before purchasing and applying herbicides. To get started, view our summary of state and provincial herbicide resources, including approved herbicides and permitting information. 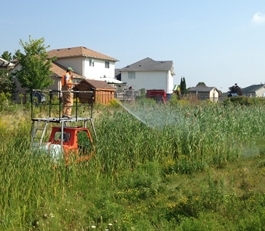 Methods used to apply herbicide vary depending on the size of the area requiring treatment, the density of the Phragmites stands, the composition of the surrounding vegetation, and the capacity of the management team. There are at least two herbicides (glyphosate and imazapyr) that are effective at managing non-native Phragmites stands and are commercially available under a variety of names in the United States and Canada. These chemicals are not species specific, so care must be taken to avoid harming native plants. Imazapyr remains active in the soil longer than glyphosate, and threfore, can have greater non-target impacts if used in areas with greater plant diversity. Additionally, different chemical formulations are available for application over land and over water. It is importantto use the formulation approved for aquatic use, because overland formulas can harm amphibians, fish, and invertebrates. For more information about herbicide impacts on amphibians and reptiles, see p. 19-20 and 71-72 of the Michigan Amphibian & Reptile Best Management Practices document. When using herbicide to manage non-native Phragmites, if the entire clone is not killed, the remaining rhizomes may produce new stems the following year. In some cases, these take the form of a “witches broom” growth, with many small stems growing from a single node that may be buried or exposed. Resprouting stalks and witches brooms require follow-up herbicide treatment. Prescribed fire can be an effective tool for removing dead standing biomass of invasive Phragmites. This technique can be used as part of a comprehensive management program when proper permits and safety protocols are in place. In the video below, we feature the City of Ann Arbor, Michigan’s Natural Areas Preservation crew using fire to remove dead standing Phragmites biomass. Do you have lessons to share or questions about the use of fire in Phrag management? Contact us or ask the Listserv! Fire is not effective as a stand-alone management technique because it does not affect the root system and may stimulate growth and increase density. Removing the biomass can allow for more effective future treatments and can stimulate native plant regeneration. Ideally, burning should be conducted during the dormant season following herbicide application. Video acknowledgements: Thank you to the City of Ann Arbor, Michigan, and Natural Areas Preservation staff and volunteers. This video was filmed and produced by Reilly Manz, Great Lakes Commission. This video is and content is for information purposes only. Permits and safety protocols for the use of fire in management are required and vary significantly by jurisdiction. The Great Lakes Commission, Great Lakes Phragmites Collaborative, City of Ann Arbor, and partner organizations are not liable for any loss, damage or other impacts resulting from this video or other any other management guidance. Like prescribed fire, removal of Phragmites biomass by mowing or cutting is not effective as a stand-alone method because it does not affect the root system and may stimulate growth and increase density. However, at sites where burning is not an option it is a useful way to reduce the biomass of dead standing stalks after herbicide management. In areas where fire is not an option, mechanical removal can be a good choice. The method for removal depends on site characteristics, including size of area to be covered and if soils can support large machinery. If mowing activities will be conducted without the use of herbicide, mowing or cutting should be completed before the plant starts producing seeds, to lessen risks of introduction into adjacent habitats that are not yet invaded. Long-term research on the effects of repeated mowing would be valuable. Remember: Any equipment used to manage non-native Phragmites should be cleaned of all debris (plant fragments, seeds, mud) before it is removed from the treatment site to prevent the unintended spread of seeds or rhizomes to other areas. For more information on cleaning equipment, see Ontario’s Clean Equipment Protocol. Carlson, Kowalski & Wilcox (2009). Promoting Species Establishment in a Phragmites-Dominated Great Lakes Coastal Wetland [visit Natural Areas Journal to obtain a copy]. For small stands of Phragmites, manual removal may be possible if there are many hands to help with the work. It can be a viable option for small areas where managing with herbicide is not possible. Cutting stalks above the surface is not effective – Phragmites is a grass and cutting can actually stimulate growth. A technique that cuts the stalks below the soil surface can be effective in small patches with loose soil or sand substrate. This ‘spading’ technique was pioneered by Lynn Short on Georgian Bay. Click the image below to view a description of the technique with tips for success. You can also learn about this method in Lynn’s presentation in a recent GLPC webinar. Research suggests that long-term, low intensity grazing by goats and cattle can reduce non-native Phragmites density and increase species diversity in wetlands. However, grazing does not directly impact the root systems and grazing at the wrong time of year can increase Phragmites vigor and stem density. Other issues include possible changes in nutrient cycling, negative impact on remaining native plants, and physical disturbance of fragile systems. There is limited support for this method in the United States, but it is an active area of research. For more information see our blog post on the Becka Downard’s research (Utah State University) or Dr Andrew Baldwin’s research (University of Maryland) on grazing as a form of Phragmites control. Covering cut Phragmites with thick black plastic during the growing season can be effective in limiting its growth at small sites. High heat and lack of light will eventually kill the plants beneath the plastic. This method is most effective in small areas exposed to direct sunlight. Phragmites is capable of sending runners or rhizomes out from beneath the plastic to establish new plants outside of the treatment area. The areas covered with plastic also are not suitable for native plant growth and thus this method can reduce habitat for various wetland species. This method may be of use in delicate ecosystems with small stands of Phragmites where the use of herbicides could be difficult. This method is not considered viable for treating large stands. In 2013 study researchers cut Phragmites before covering with black plastic, and found that the method requires at least two years of application to be effective. They recommended cutting the Phragmites in June as it is the time when the plants have fewer carbohydrates stored below ground in rhizomes. Flooding cut or burned stands of Phragmites can be used as part of a multi-method approach in wetlands where managers have control of water levels. Ducks Unlimited uses this approach in wetlands with installed water management systems such as dikes. Flooding Phragmites reduces the amount of oxygen available to the plant’s rhizomes and can lead to reduced growth. Caution: Draw-downs in early summer may increase the habitat available for non-native Phragmites. Different states, provinces, and localities may have different regulations or permitting requirements regarding water level manipulation. Check with local authorities first.